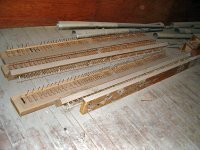 Jim Reid, fellow WHOC officer, asked me this question: Which is better - the MidiTzer or the Virginia WurliTzer for Hauptwerk 2? This is what I told him. When I seriously dived into the digital world back in 2002, the aim was to improve my analog Rodgers. By then I had heard both the Allen and the Walker instruments. 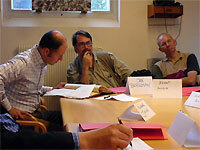 In fact, the first time I heard a Walker was at the Milwaukee ATOS Convention in 2000. 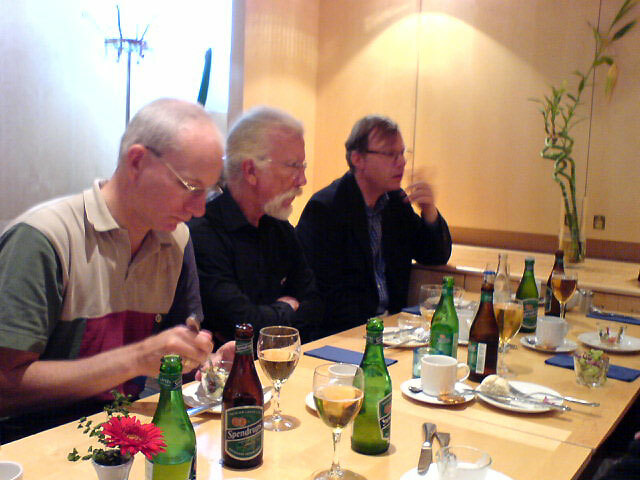 My first contact with Bruce Miles' soundfonts was in early 2003 I think. I was really impressed and they sounded so much better than my analog stuff. When I retired in 2003 I could spend a lot of time on various organ items like MIDI-fying and testing various relay programs. The one that stood out was the MidiTzer. It sounded so good with Bruce's fonts. We do change and our demands increase over time, however. When I bought my Rodgers in 1975, I was totally amazed by its sound. 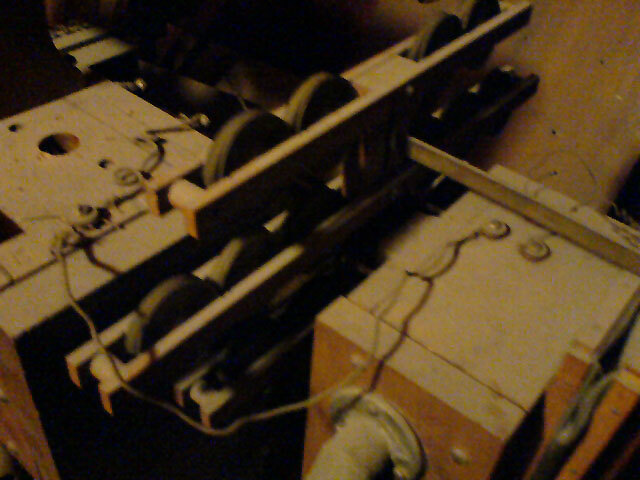 Today the same sound is no way near what a theatre organ should sound like and it is outright disappointing. Is that because it had deteriorated? No, I think it's because I nowadays have higher expectations. 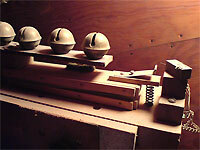 The MidiTzer was the way to go although it couldn't compete with the Allen or Walker instruments. But, it was miles ahead of my old Rodgers. And it worked like a real WurliTzer, and this was important. The soundfonts improved steadily and we have a winner. 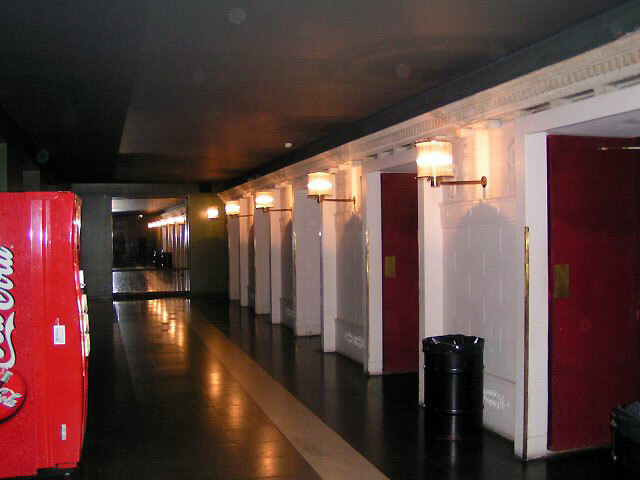 Enter the Virginia WurliTzer for Hauptwerk 2. This is an entirely different animal. Now there is a real thing, every pipe sampled. The tremulants were modeled instead of sampling pipes with tremulants on. 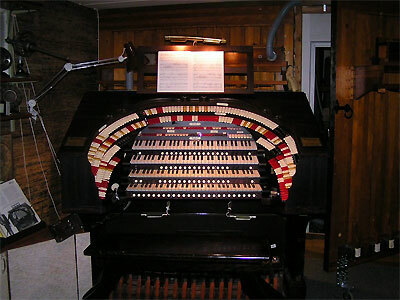 With random detuning and tremulant speed and other devices simulating a real WurliTzer, this would be it. Finally, real theatre sound would be filling the house. I must confess that I was somewhat disappointed when I first installed it. The sound was no way near what I had expected. What was wrong? Was my expectations way off target? Was there something wrong with the installation, like speakers, amplifiers or soundcard? As you know, Hauptwerk 2 recommends a soundcard with ASIO drivers. I decided to swap one of my Creative SB Live! cards with an EMU 0404. This was possible since the MidiTzer now had the Fluidsynth engine and did not require a Creative SB Live! card. The EMU card did improve things once I managed to understand how the patch panel worked. It's a normal two channel stereo. The MidiTzer is a very good approximation of a WurliTzer, but the soundfonts are too perfect. 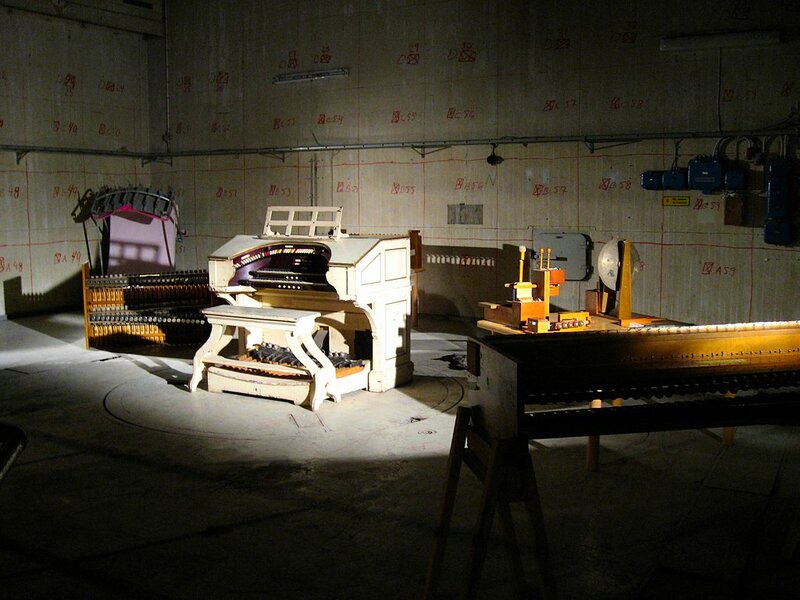 There is no question, it does sound "electronic" but less so than any analog organ. I have tried the John Tay fonts but I don't like them. 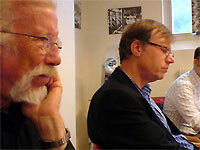 There are some voices in his fonts, like the Chimes and Chrysoglott, that are very good. The tremmed Tibias with their individual trems are not acceptable. 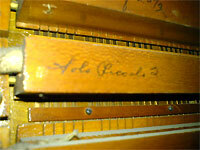 Bruce's Tibias are better and even those have individual trems. But this doesn't bother me like the John Tay soundfonts. 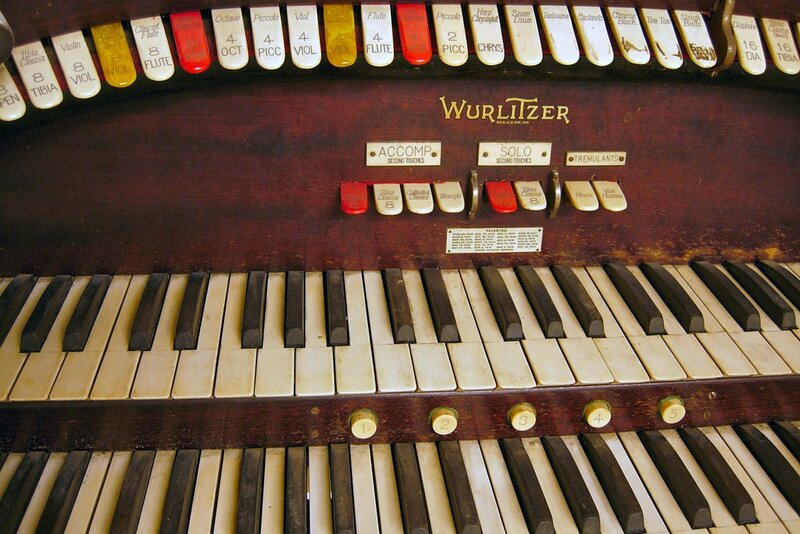 The Virginia WurliTzer to me sounds more like the real thing. Together with the Hauptwerk 2 features it does take away most of the "too perfect" sound that most electronics suffer from. But why doesn't it sound like what we expect. 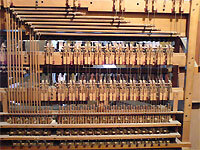 All WurliTzers are individuals so there is no standard, but they all have a recognizable sound. Here's my theory. 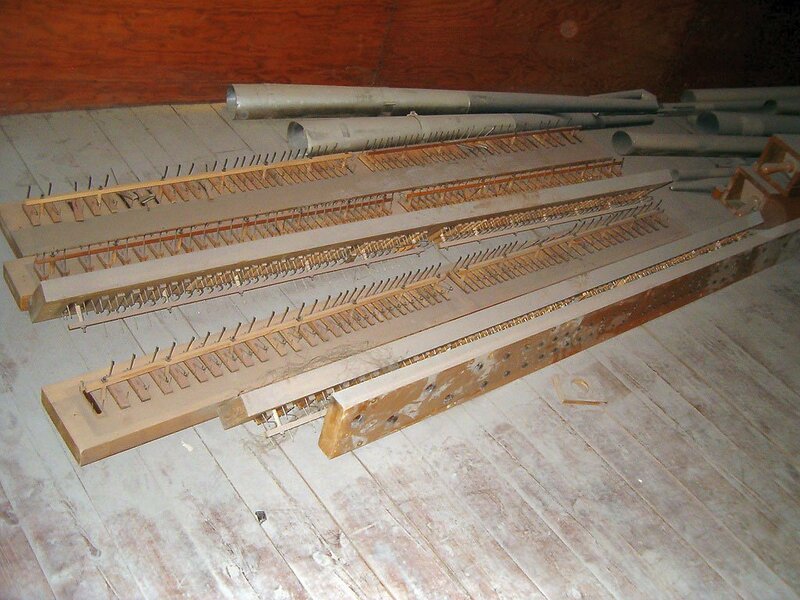 Having had the possibility to listen to a few WurliTzers under different conditions, I would say that the Virginia sounds like you are in the chamber. 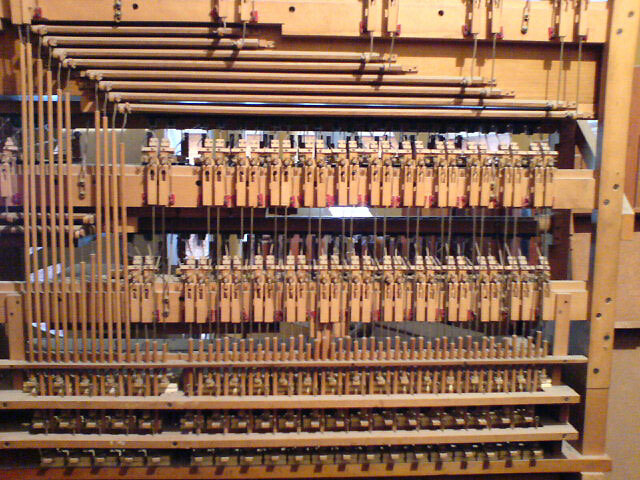 I visited recently the only working Wurlitzer here and this is a home installation where the console is just a few meters from the shutters. The chamber is very small and the sound is very dry and it sounds just like the Virginia. To get my installation to sound like the real thing requires a lot of work and some heavy investments. Basically I think you have to simulate a theatre full of people. 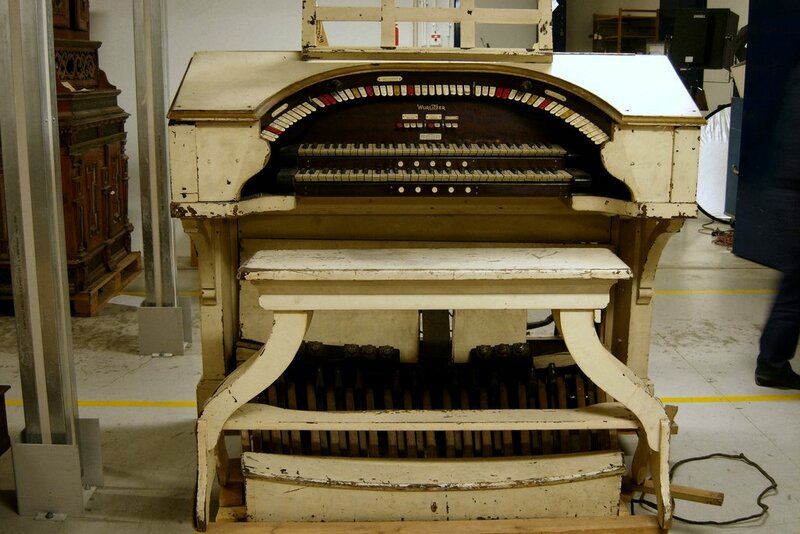 That has to wait, the primary objective is to get the Skandia WurliTzer up and running. In conclusion, the Virginia has the edge, far more realistic than the MidiTzer. Which one do I like? Difficult to answer. I do like the sound of a vintage Hammond with the original, no Leslie, tone cabinet. The Hammond doesn't sound like a theatre organ but I still like it. Same with the MidiTzer, I do like it and the MidiTzer name plate replaced the Rodgers one and it will stay. What I believe is that the Virginia is really the first try (not counting the Allen and Walker instruments) with the Hauptwerk 2 concept. 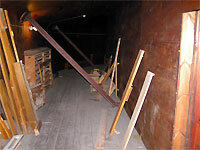 We are just in the beginning and more work is needed, especially in the amplifier and speaker area, before we are done. 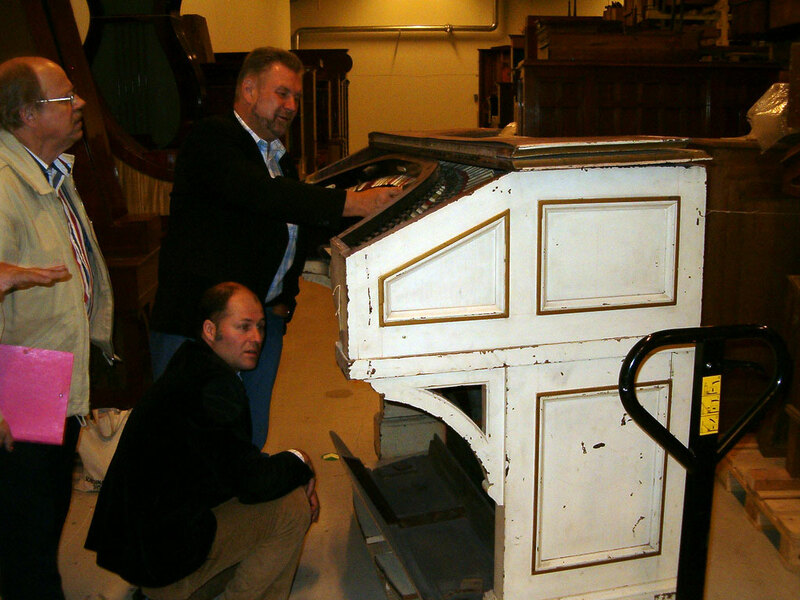 Some days ago I spoke about the only WurliTzer in Stockholm, Sweden, originally installed in the Skandia Theatre. It has been in storage for 35 years. To try to get it playing again, we now have a group that is dedicated to do just that. 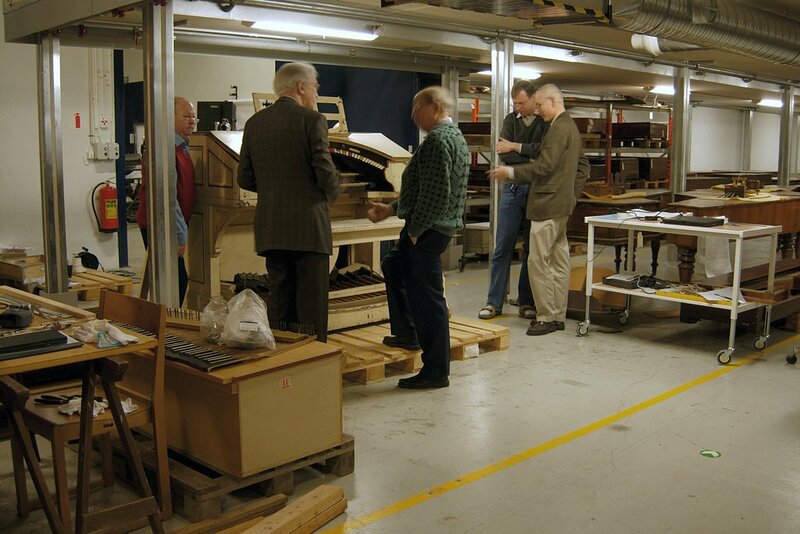 This group consists of several prominent persons, like the City Hall resident organist, an organist who actually played at the Skandia Theatre, an organ builder, a representative from the Skandia theatre, people from the Audio department at the Royal Institute of Technology, and some others with interest in theatre organs or organs in general and myself. 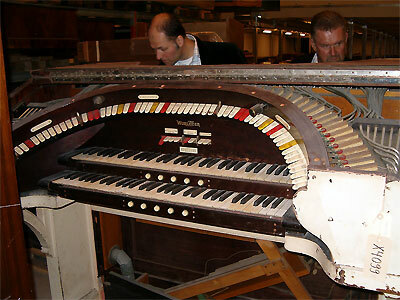 Today, the group has 17 people all interested in getting the Skandia 2/7 Mighty WurliTzer playing again. An inventory has been done at the City Hall and most of the pipework has been found. 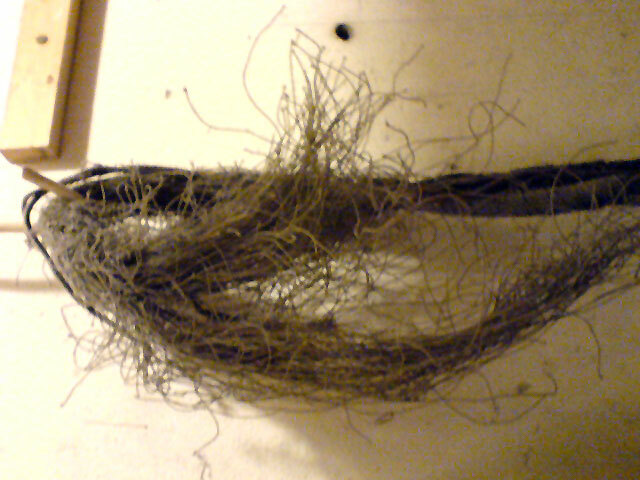 The traps seem to be OK but there are still some parts missing. After 35 years in storage things get moved around and parts are lost. It shouldn't be a problem to get everything, and spare parts are available so the missing items will have to be made from scratch. One hundred years ago on September 18th of 1905, Greta Louisa Gustafsson was born in Stockholm. She later changed her name to Greta Garbo and moved to Hollywood. She died in 1990 and was interred at Skogskyrkogården (The Woodland Cemetery) here in Stockholm. 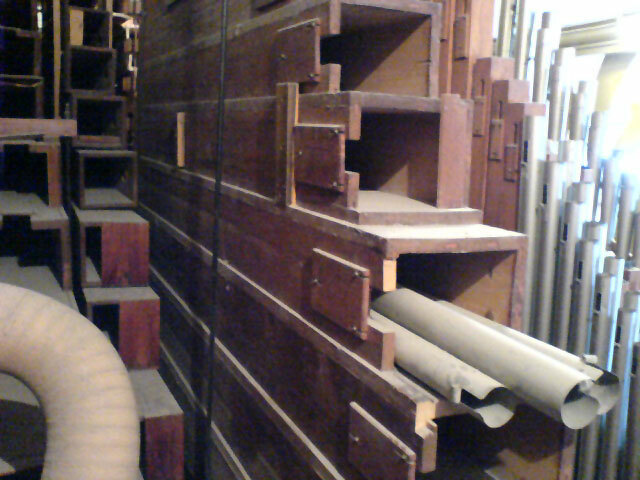 What has this to do with Theatre Pipe Organs? The Woodland Cemetery was designed by G. Asplund, a famous architect. He also designed the Skandia Theatre, home of the only Mighty WurliTzer in Stockholm. The Woodland Cemetery is inscribed on UNESCO's World Heritage list. Click here and here to learn more. On September the 19th of 2005, the WurliTzer restoration group met at the Skandia Theatre. 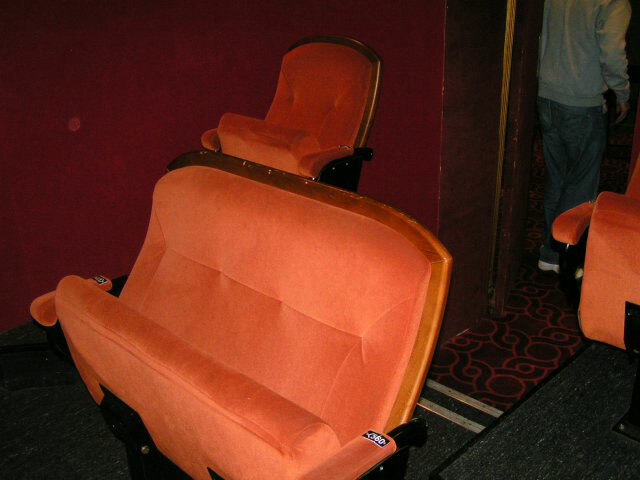 First a movie was shown, really a news reel from when the theatre was built, followed by more news from when the theatre celebrated its tenth anniversary. 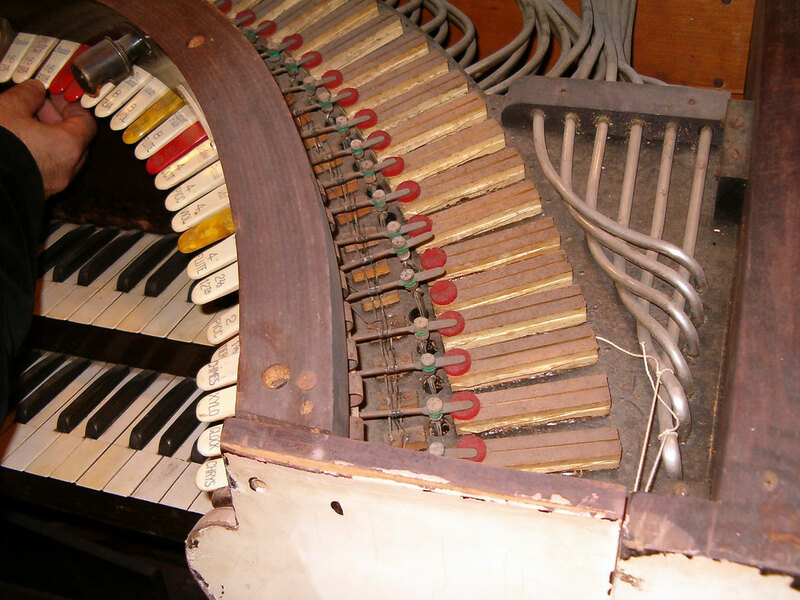 Finally, a short clip from 1944 showing a demonstration of the Mighty WurliTzer was screened. After that we had a thorough look at the theatre. Below are some pictures I took during the tour. 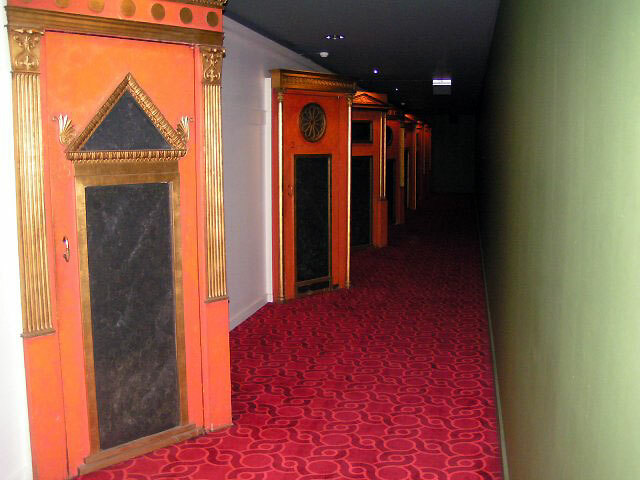 The theatre is not used presently but the future is secured. It will be restored completely. It still looks OK but there are details that need to be repaired. 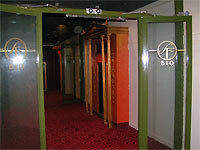 As you can see from the pictures, it is well maintained and everything is kept in working order. 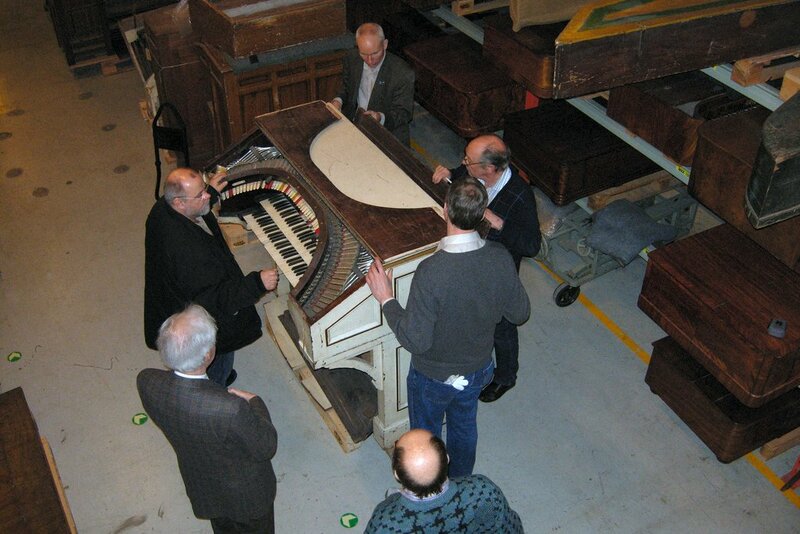 One of the main items on the agenda was to look for traces of the organ. There has been persistent rumors that the chamber is gone due to redesign and new buildings around and parking space below. This is not true. The chamber is still there. 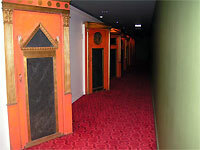 It is located on the stage level and is now used for storing stuff. 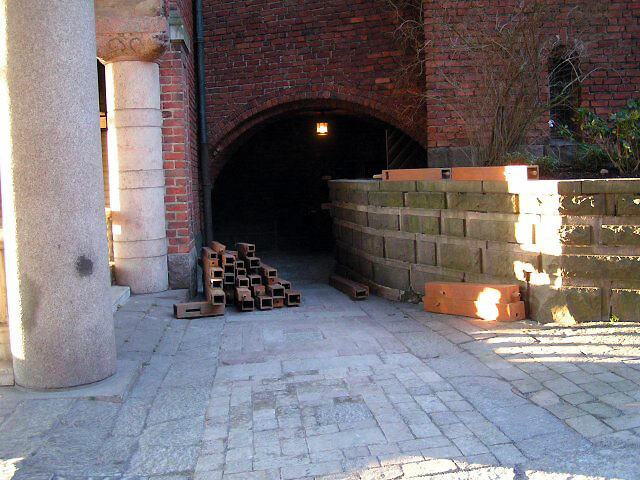 An inner wall has been installed so that it doesn't look like a chamber. Also, the opening where the shades once were has been closed. 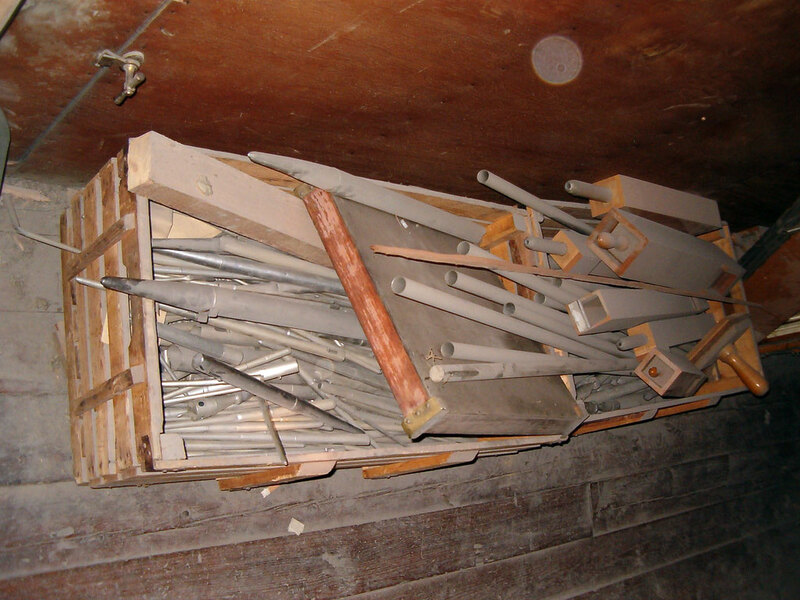 This gives renewed hope of actually putting the organ back into the theatre. The management is in favour of this, but the owners are somewhat hesitant. 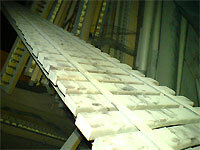 We can't just show them a lot of dusty lumber and say one day it will sing. We have to install it some other place first, fix it and then get it going. The key thing is to convince the owners that money can be made. That will take some time. Right now, all is go, and the next step will be a complete inventory of the parts in the City Hall. On Thursday, November 17th of 2005, three of us had a full working day, from 9AM to 7PM up in the attic of the City Hall. The main objective was to sort things that made sounds. 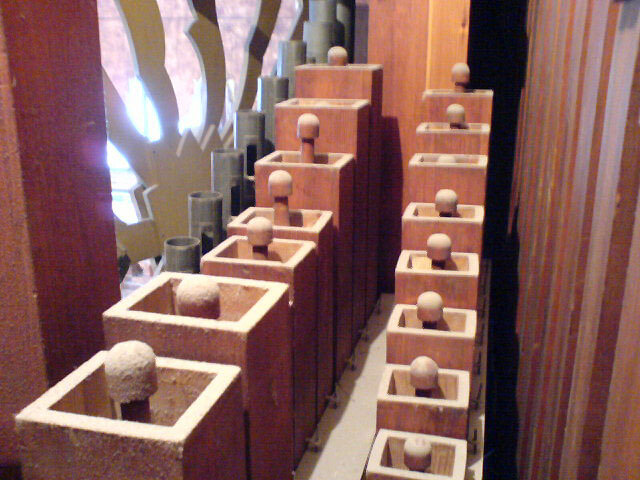 There are pipes and parts for at least 2.5 organs, lots of them are big wooden pipes. 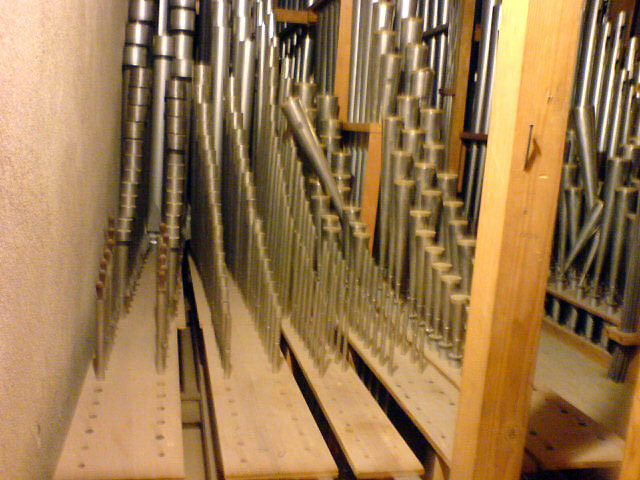 One of our guys works in an organ factory and he could quite easily identify the WurliTzer pipes. 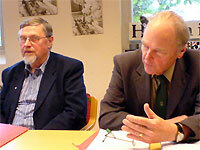 In the afternoon we sat down and looked at the accomplishmend. We found all of the pipes, even the tiny little ones. 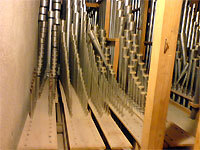 Well, not really all of them, one (1) pipe is missing, the top note of the Vox Humana. This is a labial pipe so it's easy to replace. We all think this is something. 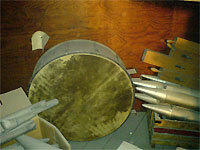 There are some damage, especially the big trumpet pipes are quite dented but they are repairable. All the wooden pipes are in excellent condition. 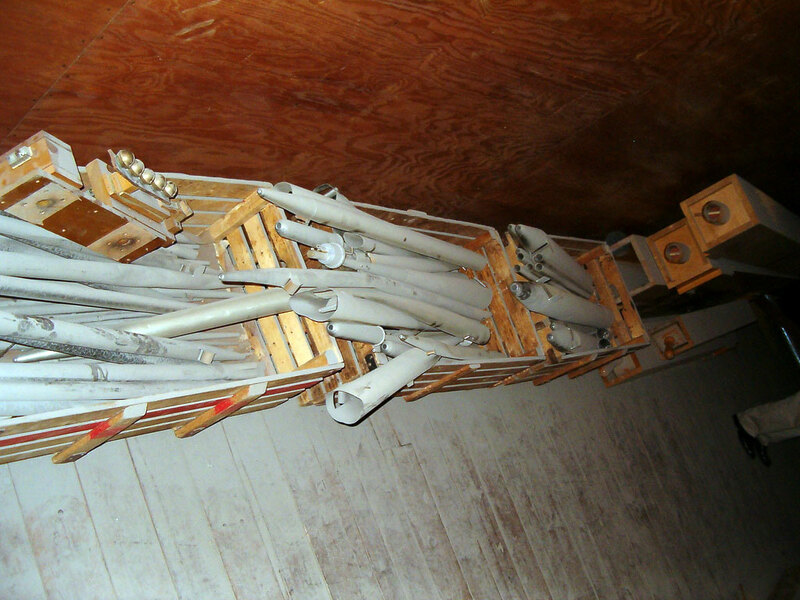 We also located all of the traps and percussion, nothing is missing, drums, cymbals are all there. 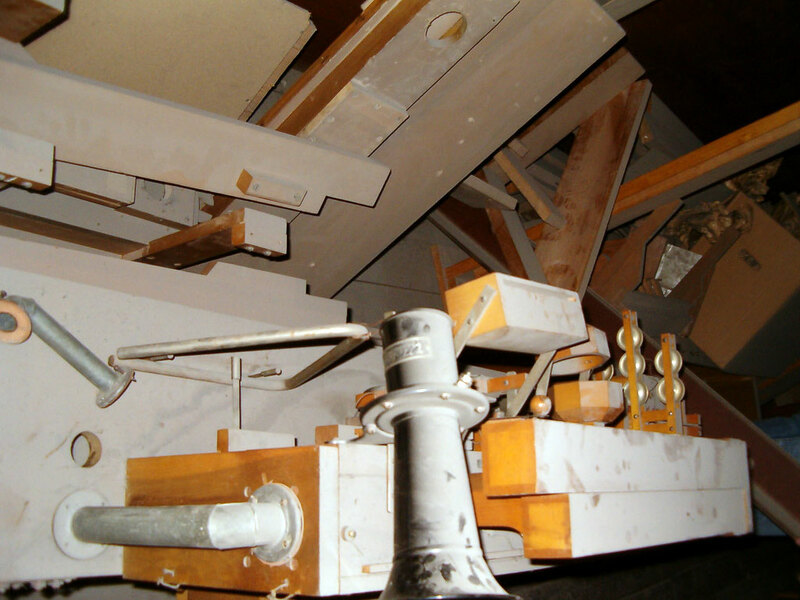 The main chest has been taken apart and it needs a lot of work before it can be operational again.But, all in all, everything seems to be there, which we think is quite something. 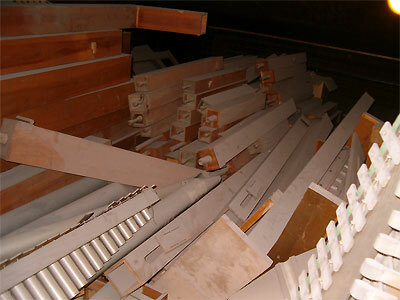 I would have thought that after more the 40 years in storage together with various junk, lots of stuff would be gone. Next time we will concentrate on the other stuff like swell shades, offsets, regulators and what have you. 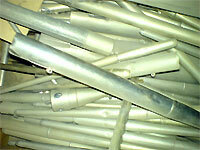 We have spotted these things under loads of junk. 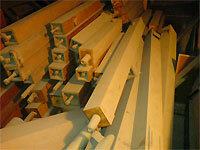 Also we need to sift through the tons of lumber that laying around. 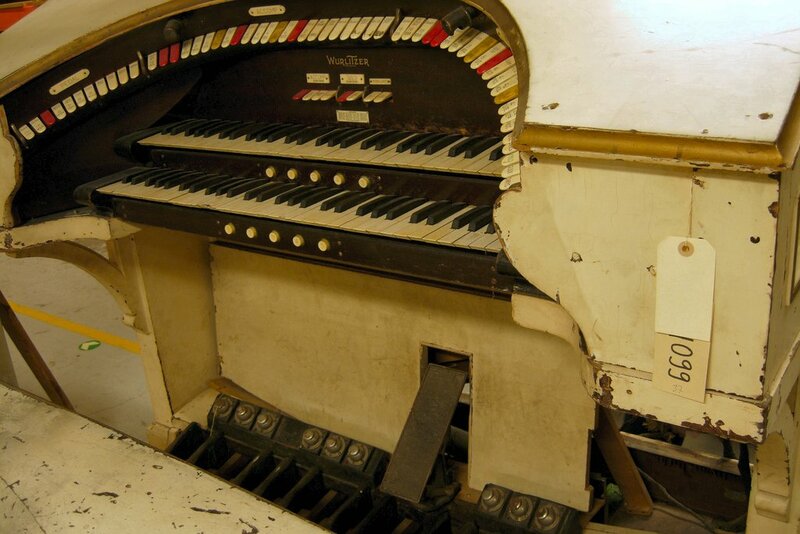 We suspect some of it belongs to the WurliTzer. 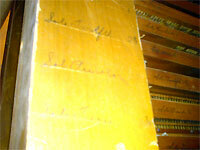 We concluded the inventory of the WurliTzer. It looks promising but there are some parts missing. Most of the erection lumber is missing but that's no big deal. Two regulators are missing but there are a few more places to look at so we have not given up yet. Also the bird whistle and the ACME siren are missing and we suspect these things are lost forever. The parts have been stored in the accoustic tunnel that carries the sound from the echo chamber. There are a lot of other pipes stored there which rendered the echo chamber useless. 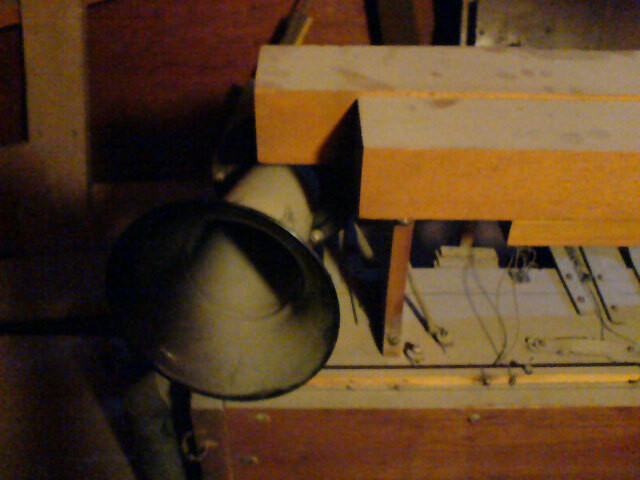 On Tuesday, November 29th, 2005 we fired up the echo chamber blower and checked the sound from the main hall. It was not quite convincing owing mainly to the fact that it was the first time in 50 years since anybody tried it. Interesting excercise. 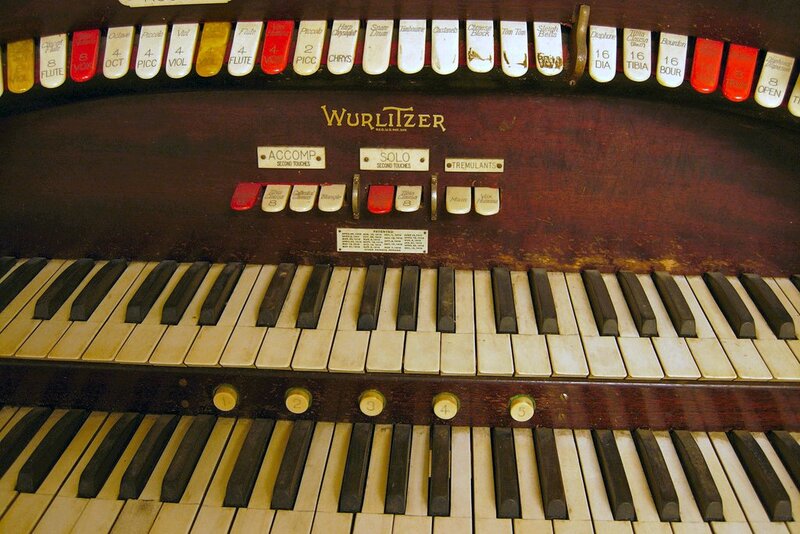 Friday, December 9th of 2005, we had a status meeting regarding the resurrection of our WurliTzer. In the morning we discussed various plans for upcoming activities. Everything looks fine so far. 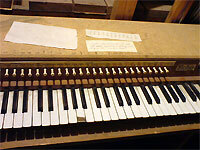 Most of the paperwork is done regarding the actual acquiring of the organ. One snag, we will not receive it for free as we originally thought. This is because the City can't give things away, assets have to be sold. The sum has not been finalized but should be about, in equivalent US money, 65 cents. We agreed that the group could afford that. The afternoon was more of a show. One group member, a truly remarkable man, had brought his street organ. This is an absolutely fantastic thing, built entirely from scratch. 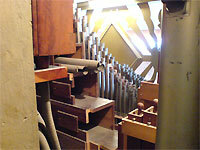 I urge you to visit his homepage and look at the Organ Project. The show included also a concert by Jelani Eddington. 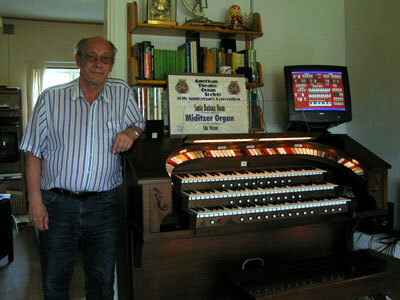 He kindly sent us a DVD with a two hour concert on a 2/11 WurliTzer in Australia. 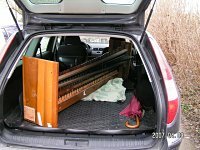 It was fun to hear the reaction from the group members who are church organists. 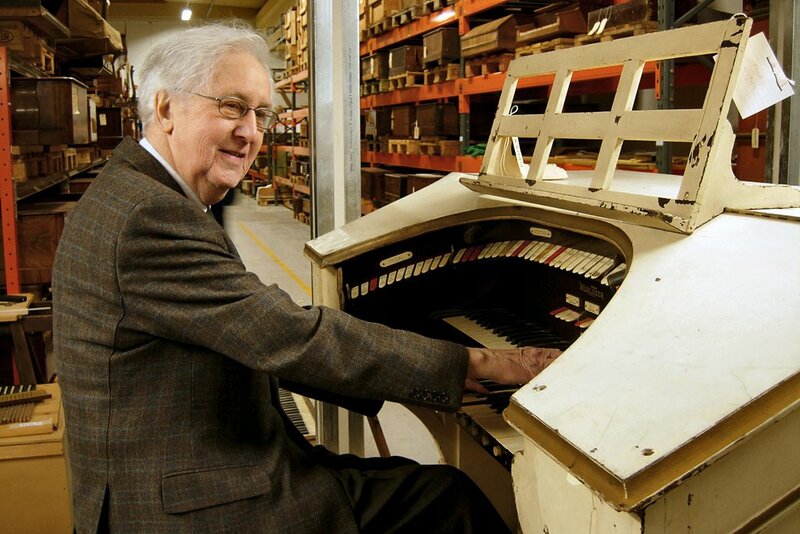 They had never seen a theatre organist in action before. 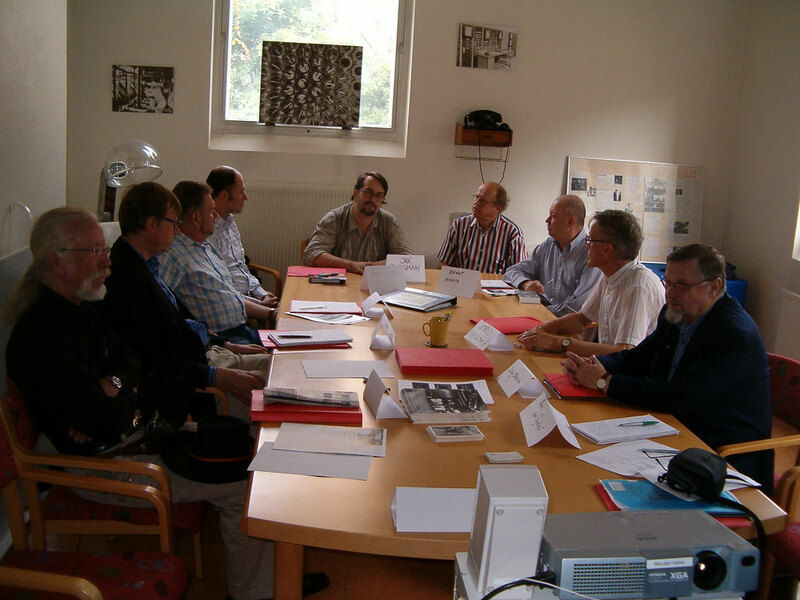 The meeting was held at the place where the WurliTzer will be installed initially, in the Reactor Hall, the site of an former experimental nuclear reactor. The place is spooky. 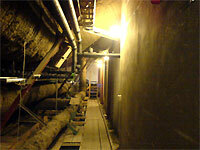 It's like a cave situated 25 meters below the street level and in solid granit. 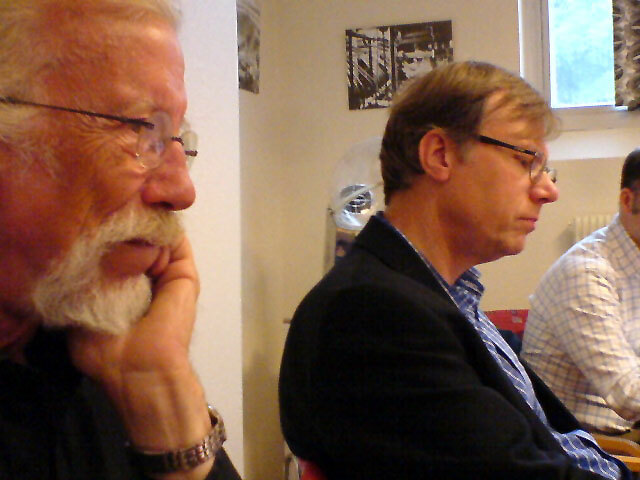 Below are some pictures from the meeting. I think I have embarked on spectacular journey. Skandia 2/7 Mighty WurliTzer undergoing restoration. 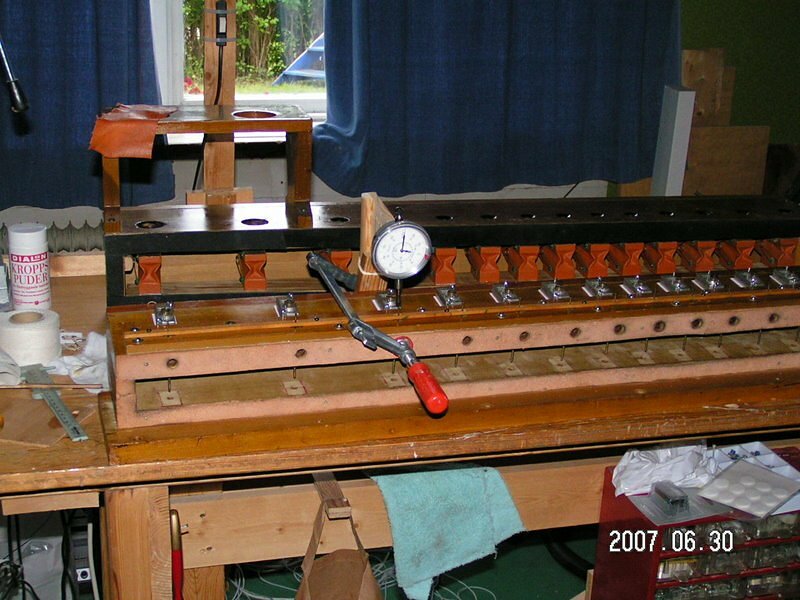 On Tuesday, June 20th of 2006, our WurliTzer's Chimes unit was sitting on my workbench. 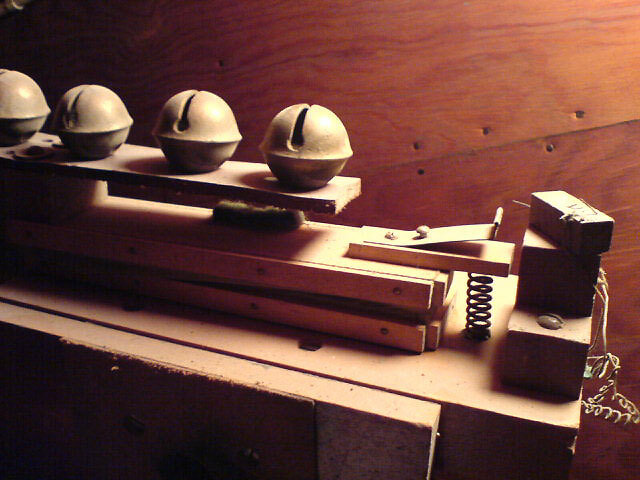 It is moderate in size and easy to work with. A slight alignment problem was taken care of during assembly. 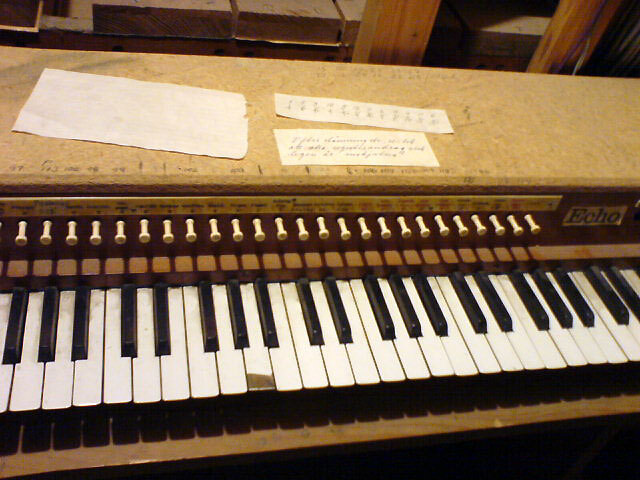 Note also the original leather nut at the top. Look at the primaries and valves. This is most likely the original leather and it's still OK after 80 years. All the magnets are also OK. I'm working on a test rig using the Midibox design. 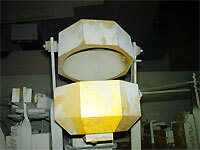 When the Chimes unit was rebuilt I hooked it up with MidiTzer and ran it from there to test the switches. It would have been much easier with a wind supply so I could actually hear it play. 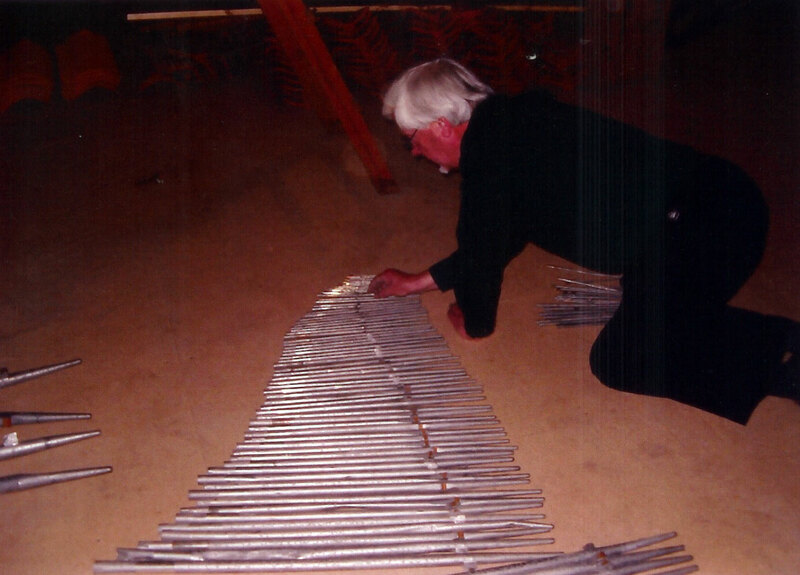 The set of Cathedral Chimes were one of the first things I worked on mainly because it was a fairly small unit, although when I installed it in my little workshop it took up a fair bit of space. 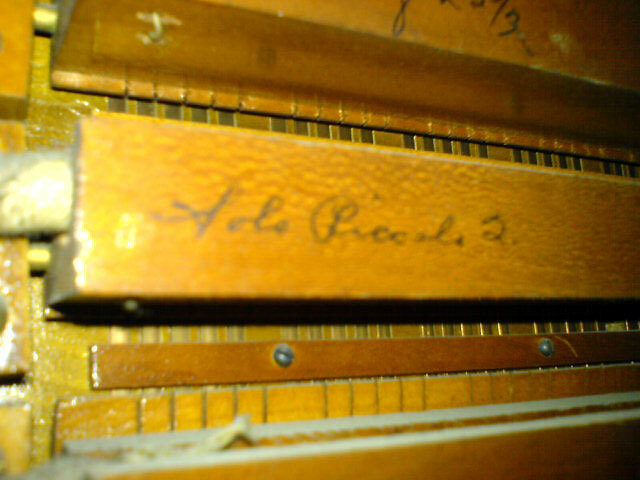 Anyway, after dismantling, releathering and some adjustments it now plays again after 40+ years. I can actually play it from my console. It has been great fun and a good insight in the technology from the 1920's. 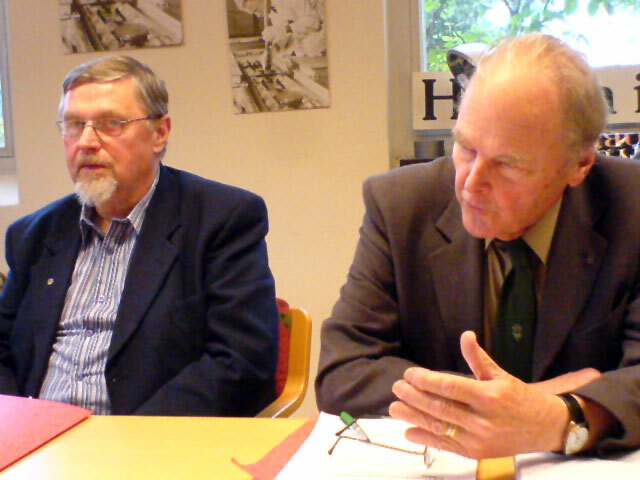 One of the group members, Dr. Johan Liljencrants, a retired professor, has provided a lot of interesting insights specifically in the air servo technology used. 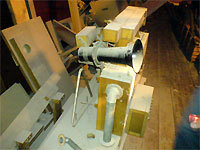 At his site you can see the complete testing outfit, blower and regulator. It also shows my laptop with a Creative Extigy used for MIDI connection. Another picture shows an earlier state where some of the primaries are not yet installed. A small step but there has to be a beginning. 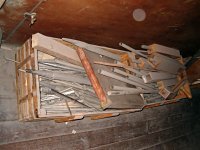 On Friday, August 19th of 2006, we went to the City Hall attic and collected some more stuff to restore. 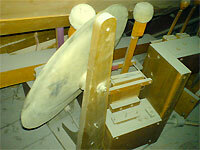 The Glockenspiel, drums, cymbals and some special effects were carried down and brought to my house. I worked on the Glock while Dr. Liljencrants was working on other parts of this wonderful machine. 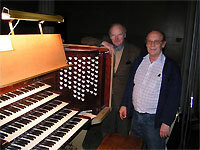 It is very important to have an understanding family when working with theatre organs, virtual or real. 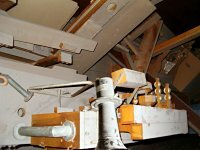 In the group we have a professional church organ builder who has told us that various bird sounds are available as options on church organs, so he will find a suitable replacement. ACME sirens are not yet options on church organs so I have to buy one. The car horn we have looks like the AAH-OHH-GAH type but I have not tried it. 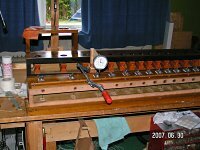 In my workshop I have a replica AAH-OHH-GAH horn that I bought from JC Whitney when I lived in the States 20 years ago and it looks similar to the WurliTzer one. We are not going for museum quality. 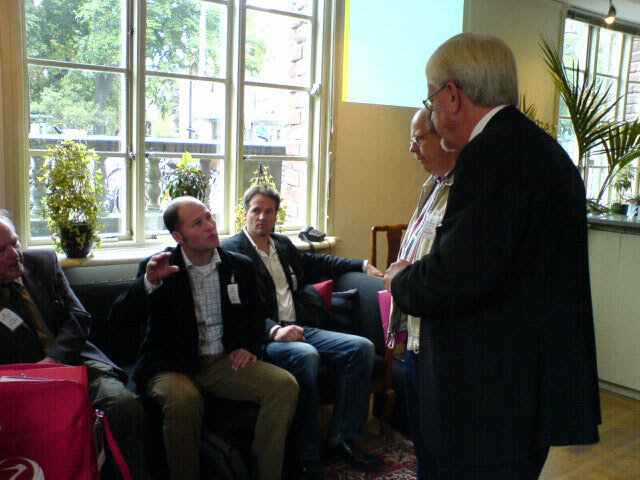 As usual we are discussing (not yet debating) whether we should keep the relay or go for solid state. I myself am kind of undecided but I tend to vote for going with the original stuff. After all it's a small instrument, it's the only one ever in Stockholm, and since we plan to put it back into the theatre (which will be renovated to "museum quality" if you can use that expression for a theatre,) it would be appropriate to keep it original. This despite what somebody calls serious shortcomings. 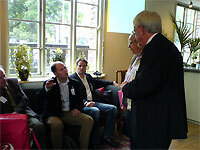 On Friday, September 19th of 2008 we celebrated the 85th birthday of the Skandia Theatre. It opened on that day in 1923. A party was thrown complete with red carpet and a lot of people dressed in 1920 style clothes. I was of course there. 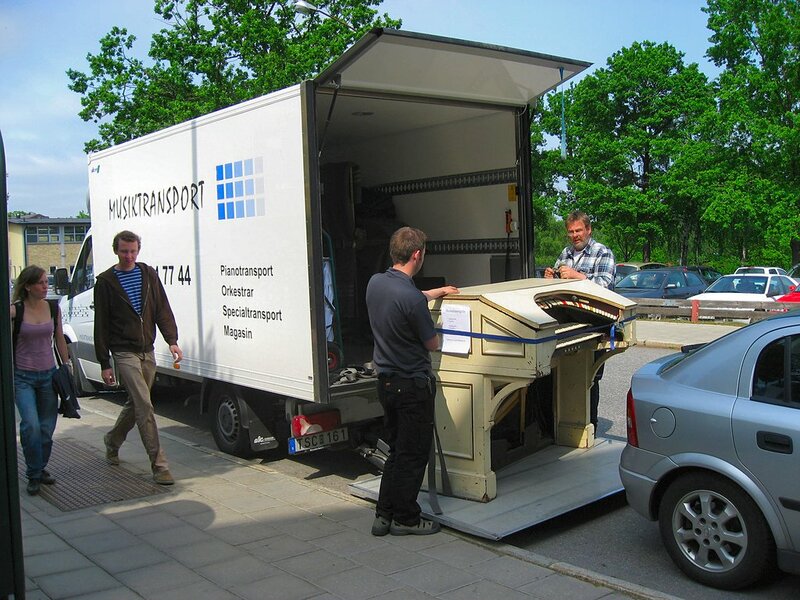 We had prepared a pamphlet about the 2/7 Mighty WurliTzer which we handed out. The program started with an hour of mingling, then some old newsreels were shown, one from the actual building of the theatre. 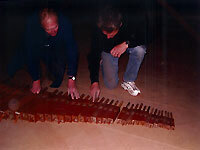 The WurliTzer was also presented with the only film clip existing. 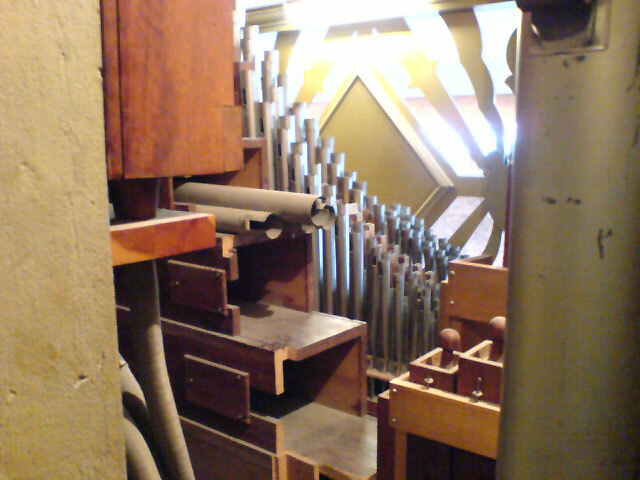 This shows the organ rising from the orchestra pit, organist in white tails. He played a short (Song of Paradise by R King) piece and then demonstrated various effects. Some shots were taken in the chamber. I have this short clip and Russ saw it when visiting me. 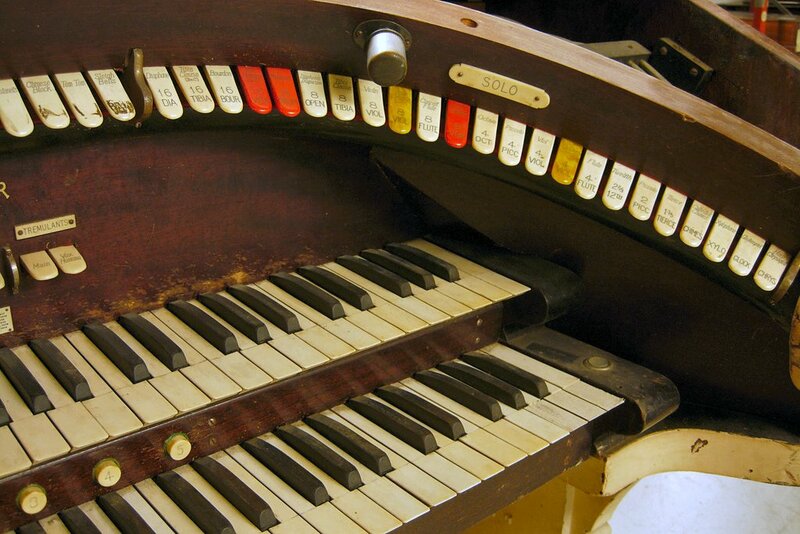 This clip generated a lot of interest since half of the audience had no knowledge about the Mighty WurliTzer. 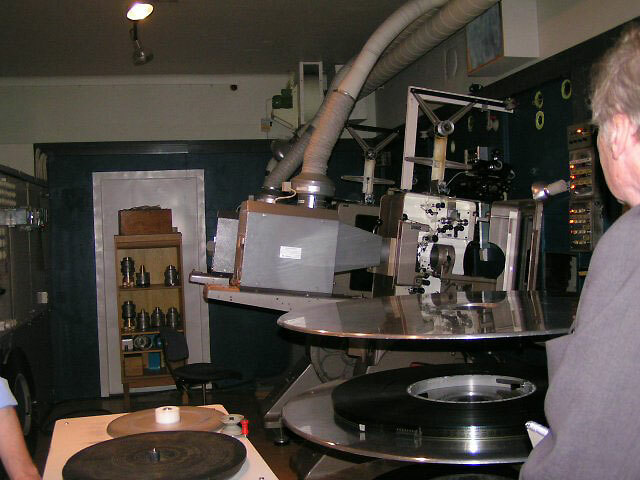 The program went on showing several old commercials from the 40's and 50's and a Swedish movie from 1934, and finally, a brand new award winning British movie. 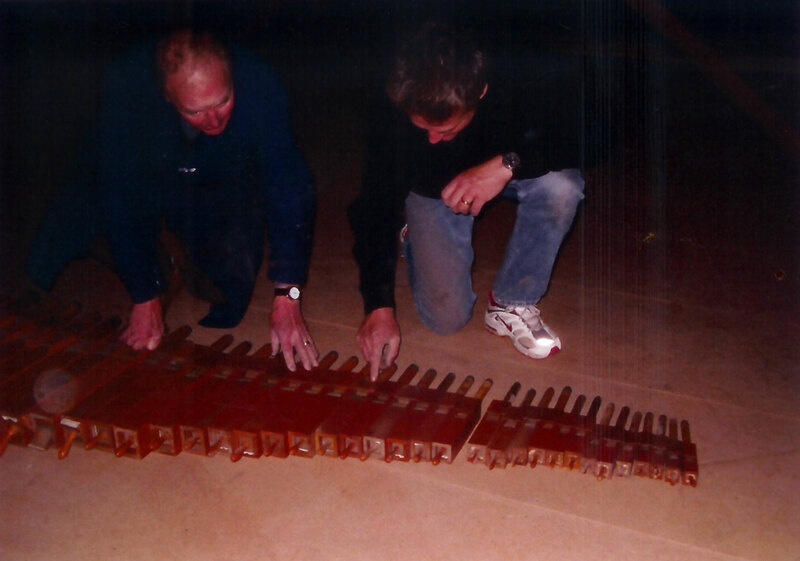 Lots of fun this was and we have certainly achieved some awareness about our WurliTzer. It must have been quite an evening according to Russ Ashworth in a letter he sent in replying to this report. 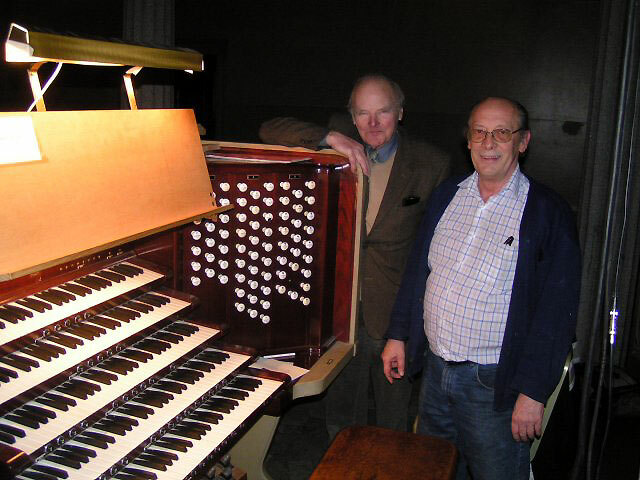 He asked if there was a chance of reinstalling the organ in the Skandia or was that not a good idea? If you, for a moment, disregard the bureaucracy there are some practical things. 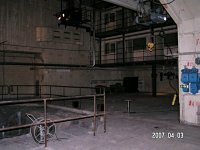 Originally there was quite a big orchestra pit allowing a 20 piece orchestra and the console. Some time in the 60's a bigger screen was installed. To accomplish that the screen was moved forward and most of the orchestra pit was covered up to allow some walking space in front of the curtain which means there is no space for the console. We have not yet discussed where to place the console but some rebuilding is required. 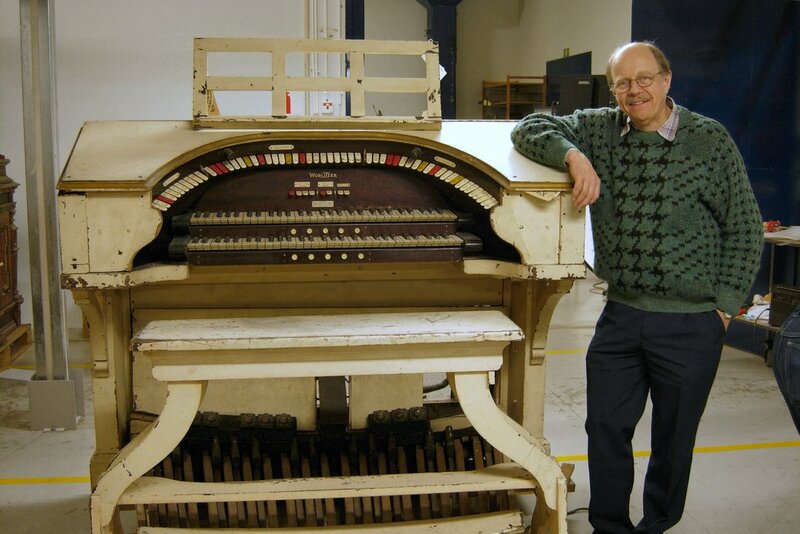 During the celebration on Friday I was approached by a lot of people who said that the WurliTzer must come back home. It is amazing what a short film clip with the organ can do. Seeing is believing. Just talking about an almost abstract thing nobody has seen or heard doesn't work. Another thing is that nobody today really knows where the chamber was located. 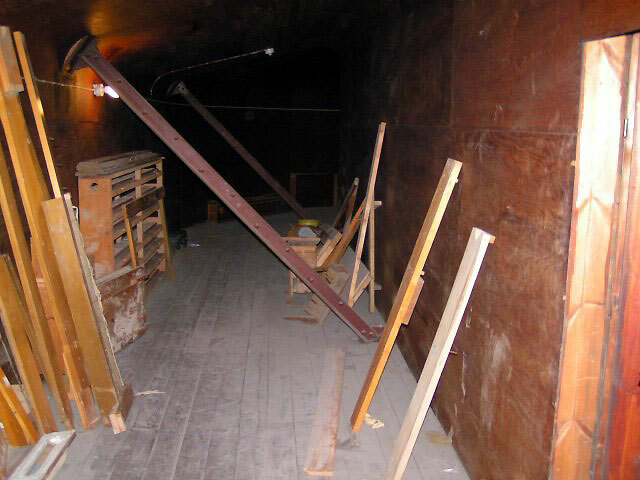 During an earlier visit I was shown a room backstage now used for storage which was believed to be the chamber. 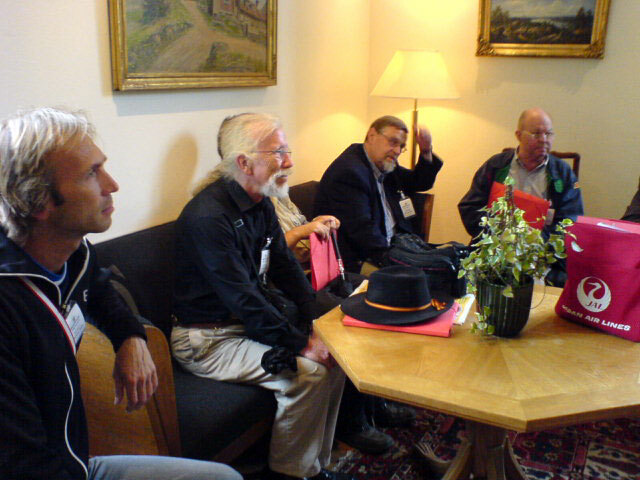 During a second visit I had armed myself with more information about, for example, the size needed to house all the equipment. More important, I now know where the grill (sound outlet) was. It was not behind the screen but on the balcony level on the right side. 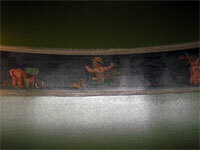 It is not visible today since the outlet is boarded up and painted to match the surroundings. But banging on it indicates it is empty behind. 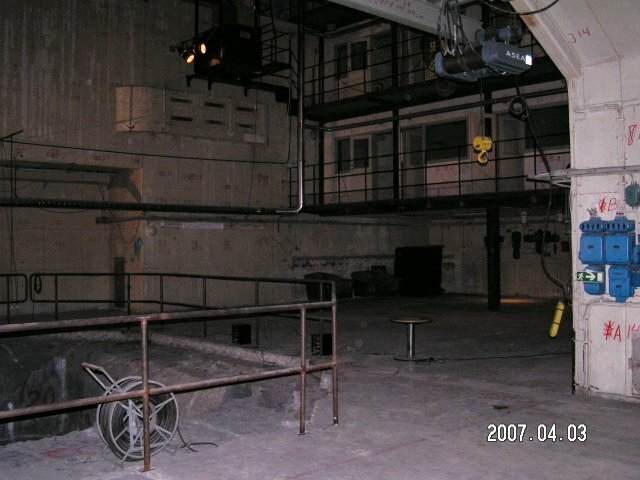 Later we are going to make a backstage crawl to really find out where the chamber was. It is definitely not the first room we were shown since there is no connection to the balcony level. 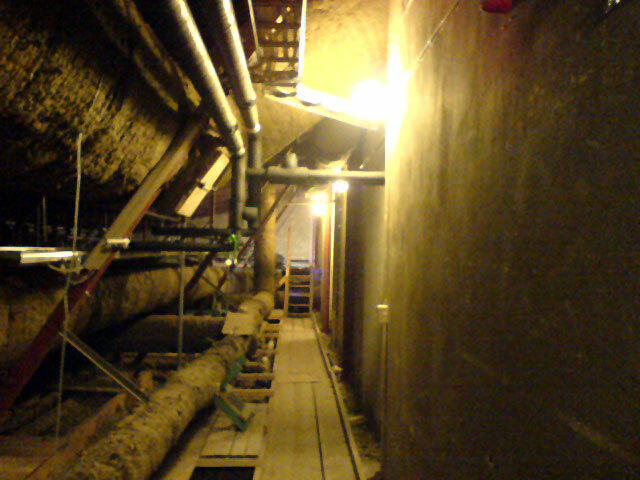 The chamber could be on the stage level but then a tunnel is required up to the balcony level. I don't know when we are able to do the crawl. 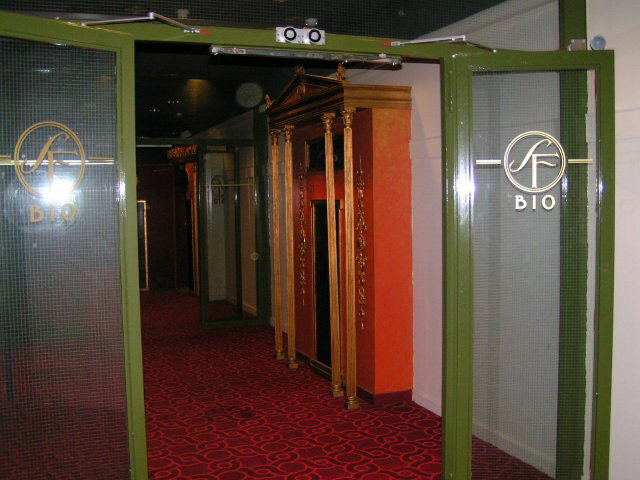 To gain access we need to drop the screen and this requires some planning since the Skandia is a working theatre. In the end it all comes down to the favourite subject these days, money. Short term and long term. I am having fun all the time! 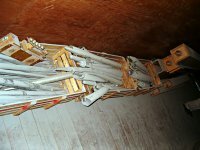 Part of our continuing effort to bring back our 2/7 Mighty WurliTzer at the Skandia Theatre is to find all known documentation. 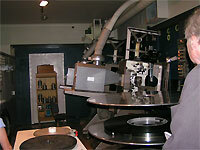 That includes film clips and recordings. 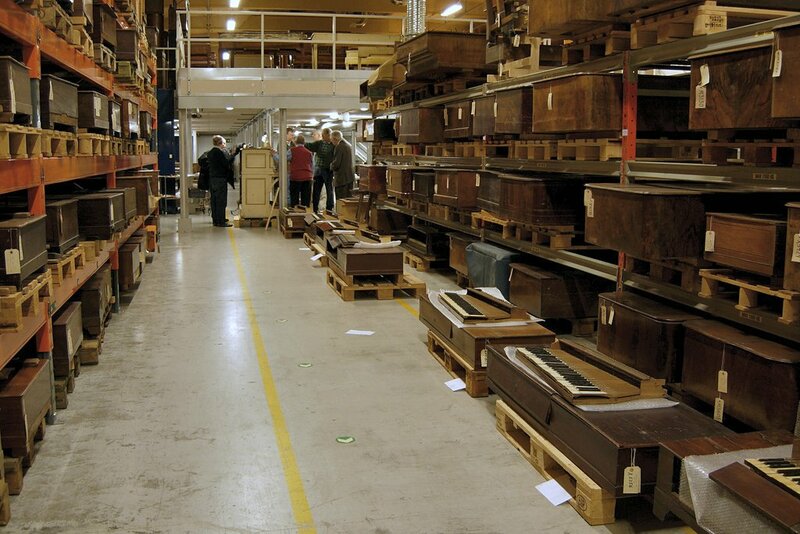 We have found some at "The Swedish National Archive of Recorded Sound and Moving Images" but we continue to search for more. One area is the National Radio archive. Since the radio was a government monopoly earlier, everything should be in one place. 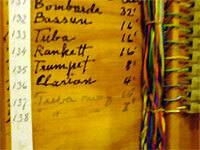 On the other hand, the radio archive is huge so it may take some time to do a full search. Below are two clips of the Skandia WurliTzer. 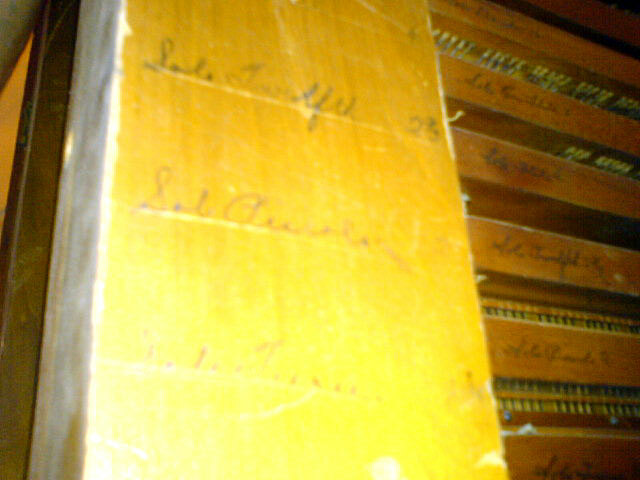 Skandia_1 is an early recording and I'm not sure of the date but it should be early thirties. 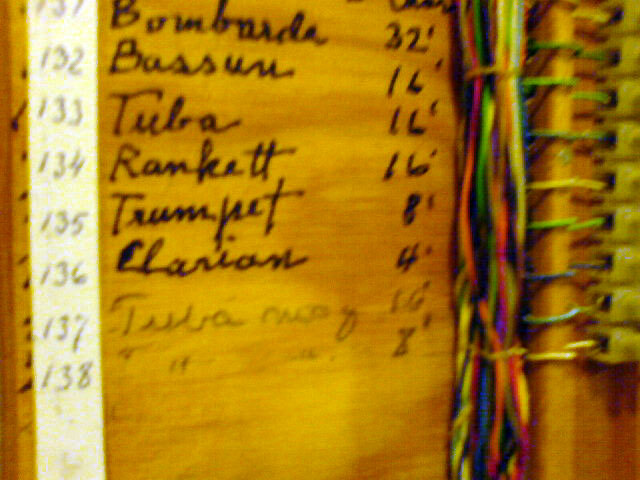 Skandia_2 was recorded in the mid forties. I think the organ and the violin mix quite well. Note that I have done no processing of these recordings, so there is some "frying tonight" background noise in them. Playing time = 0:50, file size = 0.40MB, bit rate = 64KB/sec. Playing time = 1:24, file size = 0.66MB, bit rate = 64KB/sec.